Today my husband and I tried the Marzetti Simply Dressed Champagne Salad Dressing with our salad at dinner. We had received a coupon for a free bottle of the Simply Dressed salad dressings. Upon going to the grocery store to pick out a flavor, we selected the Champagne Vinaigrette because my favorite flavor of salad dressing is Italian and the Simply Dressed Champagne Salad Dressing seemed most similar. We decided to try our bottle of dressing on a simple salad of lettuce, cucumber, and croutons. When I opened the bottle of Marzetti Simply Dressed Champagne Salad Dressing, I was immediately satisfied with the smell. The Champagne Vinaigrette smells like a sweet mixture of olive oil and vinegar with a touch of garlic. However, unlike some brands of salad dressings, the Marzetti Simply Dressed line is not overpowering to the senses. Even after I pour some of the Champagne dressing onto my salad, I could still smell the greens and the rest of my salad fixings in addition to the salad dressing. The Marzetti Simply Dressed Champagne Salad Dressing definitely lives up to its name in terms of smell; the dressing is simple, adding to the salad rather than overpowering it. I also really liked the look of the Simply Dressed Champagne Salad Dressing. Unlike some salad dressings that are an unnatural color, the Champagne Vinaigrette is a light golden brown color that contains red and green seasonings and spices. Two of the main ingredients of this dressing are healthy canola oil and champagne and white wine vinegars. The coloring of this dressing definitely reflected its simple ingredients. I could definitely see the oil and vinegars. When I tasted the Marzetti Simply Dressed Champagne Salad Dressing with my simple salad, I was immediately pleased. As the ingredients in the dressing suggest, the Champagne Salad Dressing has a sweet flavor with subtle hints of garlic and bell pepper. The texture is incredibly smooth. As with the scent, the taste was simple and subtle without overpowering the vegetables in my salad. I could clearly taste the salad dressing but could also the lettuce and cucumbers. Some dressing overpower the rest of the salad, leaving diners with only the taste of the dressing in their mouths; this Champagne Vinaigrette allowed me to taste both the dressing and the rest of food. I was extremely pleased that the Simply Dressed line was continuing to live up to its name. After I finished my salad, I still had quite a bit of dressing left in the bottom of my bowl. Because I enjoyed the Marzetti Simply Dressed Champagne Salad Dressing so much, I asked my husband to bring me some whole grain saltines so that I could sop up the rest of dressing and not waste a drop. In addition to being a delicious salad dressing, this Champagne Vinaigrette also makes a good dip for crackers. I liked dunking the crackers directly into the dressing, but I bet that I could also make a tasty dip using the dressing as one of the main ingredients! I was extremely pleased with the Marzetti Simply Dressed Champagne Salad Dressing. I will definitely be buying this particular flavor again. 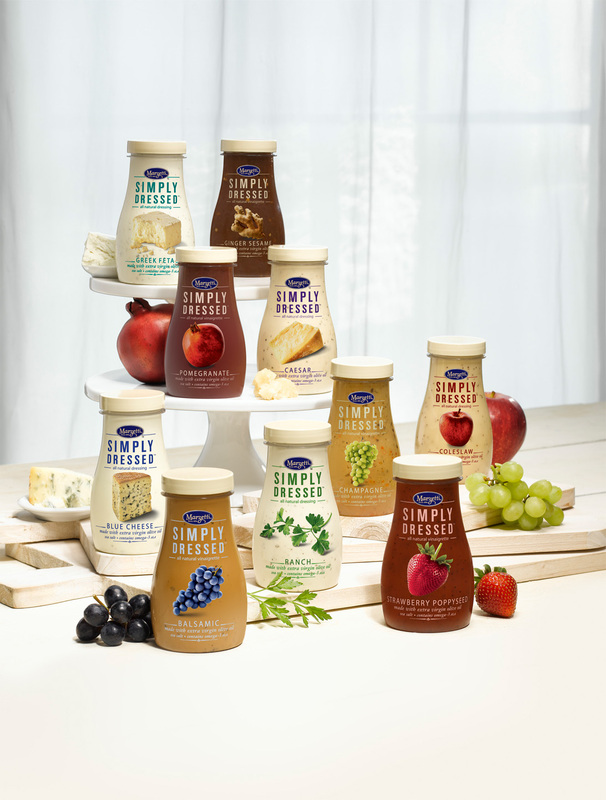 I am also looking forward to try some of the other flavors in the Simple Dressed line. My final verdict: I give Marzetti Simply Dressed Champagne Salad Dressing two enthusiastic thumbs up!